Play featured Betsoft slots at Intertops Poker or Juicy Stakes Casino this weekend to be eligible for $1000 in extra prize money. The $1000 Slots Raffle begins Friday evening and continues until Sunday night. The four Betsoft slots, all listed under the Betsoft tab within the poker software, are: Magic Shoppe, Slot Father 2, Tycoons and 2 Million BC. 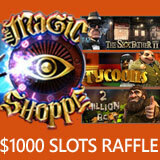 Players earn tickets for random prize draw by playing Magic Shoppe, Slotfather 2, Tycoons or 2 Million BC. You'll automatically earn raffle tickets when you play the designated slots from February 23 to 25, 2018. You'll earn one free raffle ticket for every 10 spins with a wager of $.60 or more. Winners will be randomly drawn on Monday morning. Magic Shoppe’s enchanting Celestial Boxes free spins feature is triggered by three or more Sun Box or Moon Box symbols. Every free spin wins a prize, and additional free spins can be awarded during this feature. A powerful magic wand can turn Sun Box, Moon Box or Magic Wand symbols into Wilds. The Slotfather is back with all his henchmen – including Snake Eyes Sammy, Frankie “Knuckles” and Fat Tony – in The Slotfather: Part 2. The dark and seedy crime underworld comes to life in gorgeous high definition animations and graphics. Free Spins and the Big Boss Feature Bonus Round keep players rolling in dough. Tycoons takes players into a members-only Billionaire’s Club reserved for the wealthiest of the wealthy. Even in a land before time – women wanted diamonds. In 2 Million BC, s brave stone age cave man takes a journey of epic proportions. Generous bonus features make for epic payouts. Sugar Pop 2, a sequel to the candilicious Sugar Pop slot with exploding bon bons, is coming soon to the Betsoft slots section at Intertops Poker and Juicy Stakes Casino.